Nope. Just dumping $400 million into the old one which, oddly enough, is called the New Miami Stadium. Source, including a history of the former stadium names. Yet another take on the drafting kickers/punters thing. tldr Don't draft kickers. 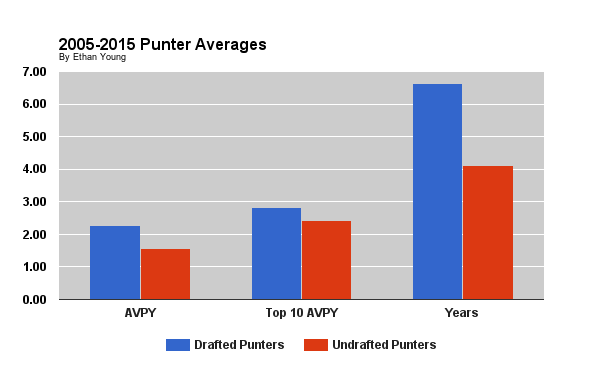 Probably don't draft punters. 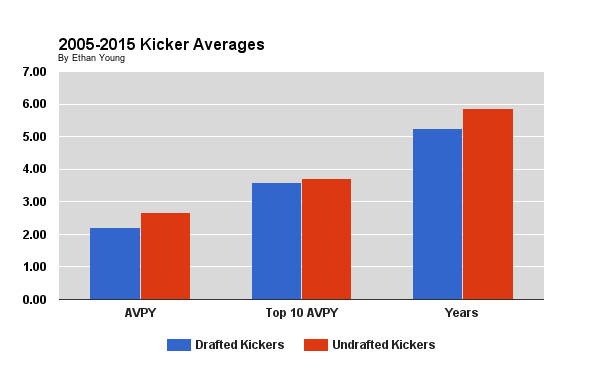 And because this does deserve a separate post: Do Kickers Belong in Football? Kickers today are better from 50+ yards than kickers in 1960 were from 20-29 yards. I think there's a flaw in that kind of charting. It is comparing undrafted players who made the team and got on the field with drafted players who did the same, without recognizing the fact that a great many undrafted kickers/punters fail to get that far, while drafted players are less likely to fail to ever play. If you add in all the 0's on both sides, the bar graphs would look a lot different. I think any discussion of undrafted players and value has to factor in the rate at which they actually do/don't make the team to begin with, you can't just jump in at the point where everyone's made the team and forget all the ones that were cut loose before the final 53. I did astoundingly amateur "analysis" based on simple things like punting average and or FG%, and the basic result was that drafted punters seemed to do consistently better than non-drafted punters, while the majority of quality kickers went undrafted. So, basically, drafting a punter is smarter than drafting a kicker. Yes, I know, Legion, f*ck Brian Anger anyways. I don't believe that will matter when looking at the top 10. The zeroes there don't even matter unless the sample size is really small (like, say, 11). Which means if the top ten of both categories end up being a wash, which it appears to be, there's no reason to draft a punter or kicker when an UDFA would end up being just as good. I would be curious to see what the charts would look like for other positions using the same methodology. My guess would be that they would be significantly different, though not necessarily analogous since you would likely have a tiny sample size of UDFA starters in skill positions. I'd have to think somebody has run some analysis based on PFR's CareerAV stat for UDFAs, but, yeah, I have to imagine that the only positions that probably have a decent likelihood of showing drafting a player doesn't really matter would be kicker or long snapper. I mean, kicker is an obvious one, so I'm glad nobody was stupid enough to . . . The problem is that who the top 10 guys are is only clear in hindsight. That doesn't help a team on draft day. My point is that, if you're a team that "needs" a kicker, most likely, your odds of getting a guy that actually makes your roster increases if you spend a draft pick than if you just grab a UDFA. Now, that said, in practice, I don't think drafting is necessarily the way to go, because there's another factor in play: the 10 year veterans sitting by the phone waiting for their next gig. I think a winning strategy is to grab veteran retreads and have them compete with your UDFA grabs, repeating until you get a guy that sticks. But when you're looking purely at the expected value of acquiring a kicker via draft versus acquiring a kicker via undrafted free agency, I think (and would love to see someone actually crunch the numbers) that drafted kickers would come out ahead when you factor in probability of making the roster to begin with, even if they do not win in a head-to-head comparison of the "survivors". That's Bryan with a "y", as in, "why do they still have good starting field position after our booming punts and Mortar Kickoffs?" I know, I know. I'm at work and have not had caffeine yet today. I think there's certainly a greater chance for a drafted kicker than a non-drafted kicker to make the roster, just because the team has spent some actual capital on acquiring that player and, smart or not, there's an inherent desire to recap that. It's the same thing that happens when a team misses an XP, and the coach for some reason decides he has to go for two to make it up. It's not entirely logical, but you feel the need to "get things back". A drafted guy is going to inherently get a better chance to stick around, just because if you draft a kicker and he doesn't make the team, the GM is going to look like an idiot. I assume this is the only reason Janikowski has lasted so long in Oakland; he's been consistently an at-best league-average kicker, and, had he been a UDFA, he'd have been cut long ago. Oakland spent a lot to get him, and dumping him would make that incredibly-dumb drafting move even dumber. You forgot the part where you keep the already better than average guy you already have instead of cutting him and drafting a kicker in the 2nd round. I think there's certainly a greater chance for a drafted kicker than a non-drafted kicker to make the roster, just because the team has spent some actual capital on acquiring that player and, smart or not, there's an inherent desire to recap that. And that absolutely does factor in as well, and that's a harder variable to isolate. I do think it's safe to say that that factors in more strongly the higher the kicker is in the draft, like your Janikowski example. For a 6th or 7th round kicker, I'd imagine it's less of an issue, though not completely absent. Then there's also the notion that a team who spends a draft pick on a kicker is more "serious" about trying to acquire a rookie to win the job, whereas plenty of UDFAs get picked up by teams who are just looking to add some competition to camp. By that principle, the drafted kicker has a better chance of sticking because he's brought into a situation that's easier to win. So there's another way to partially undermine my own argument. Bottom line is, I think it's hard to make a strong argument about the wisdom of going strictly UDFA versus spending late round picks (late! round!) on one, when those are the only two possibilities you're considering in a vacuum. But instead, I think it's a position that you attack with quantity rather than perceived quality of unproven prospects. We just don't have the numbers on how game changing Mortar Kickoffs are yet. We have to wait to make that analysis. Jeebus. You guys are talking about kickers again?! Maybe there's a soccer thread y'all can hang out at. Or an asylum. We are going to spend from now until training camp talking about specialists. I, for one, cannot wait for the long snapper discussion to start in earnest. Mortar Kickoffs are going to win games, at least for any coach who embraces "progressive, educated football". That . . . that is not good analysis. If Super-Awesome-Second-Round-Kicker-Guy can drop every kickoff at the five with no return, yes, that would be a good thing. NOT SO CONFIDENT IN THAT. There's also an entire "not terrible kicker on a terrible offense/team" thing going on for teams like Oakland, where kickers like Janikowski or Robbie Gould basically become the only reliable points for the team. It's hard to get rid of the guy who's responsible for the majority of your team's points. You cheer for the Bucs, you deserve right of first refusal on it. I also think the guy is comparing the behavior of return teams getting surprised by a short kick with how return teams will behave if kickers start routinely kicking short of the goal line. Returners will start lining up more shallowly, sacrificing some ability to hit the ground running on deep kicks (which they'll more likely just kneel down now anyway to take the 25) in order to more fully jump on kicks that come up short. Yeah, it's as if mortar kicks are going to exist in a vacuum. His analysis is likely gonna hold up, oh, the first few weeks of the season until teams catch on. It's OK; Aguayo is so good, Tampa will have won 16 games by then anyways. Well sure, when your kicker kicks 95.5% 90.0% 80.8%, how can you not run the table? That's how Florida State went 14-0 13-1 10-3, after all. Report: 2016 will be Chris Berman's last on ESPN.